To be perfectly honest, we did not travel 500 miles with the boys in the car. And probably not even The Pretenders would have managed! Our last long car journey was a mere 150 miles each way. It was all I could take, but I was very proud of getting to the end (and back) without the aid of technology. Although an iPad or a smart phone would have helped a bit, I am a fan of old fashioned car journeys. There’s nothing wrong with singing a song together or spotting things around us. In fact it’s a prime time to work on their literacy. They have no distractions and they can listen… it is a very rare occasion! I picked one of those songs that have no end. This song is about an elephant that swings on a web and than go to call another one… it can carry on as long as you can count. We counted many elephants! On the way back T fell asleep, so B, daddy and I talked about all the planes we saw in the sky. When your journey takes you close to 3 out of the 5 London airports, you cannot be short of planes to spot… trust me! It was an unforgettable hour spent talking to only one of the twins. It happens very rarely to have only one of them to talk to and it’s usually on a trip to the doctor or A&E. This was great to see him truly enjoying having both of his parents’ attention for once. We talked about the moon and the stars, when it became too dark to see any planes. A very precious time for us and B alike. Despite this positive experience, a question remains. In September we have a much longer journey planned. Should we use technology to help us or shall we trust in our ability to count elephants? First of all, you need to sit on tiny tiny chairs. This creates an atmosphere which is much better than the aforementioned freezing gym. Strangely my first thought was “is this going to break?”, but my immediate reaction also was “Don’t be stupid! Now, shall I sit on the red one or the blue one? “. As an adult, you don’t usually get to choose the colour of your chair anymore. It is obviously a sad part about getting older. The conversations were centered around much more important things than GCSE subject options. For example with T’s key person the main topic was “stickers for pooing on the potty”. A much more pressing matter! Although we agreed that B is not trying hard enough to talk at the moment and that his vocabulary could be expanded, we also agree that we are not to worried about his GCSE English language exam in 2031. For B we decided to let him choose what to learn next as there would be no point otherwise. For example he knows all the sounds of animals (such as cow, lion, snake, et …), but it has been two weeks that for daddy he only does the sealion noise. In many ways this was a typical teacher- parent meeting, but it was definitely so much more fun not to be the teacher for once! Everyone knows English is a very easy language to learn. Words are short, sentences are simple… it’s beyond me how Shakespeare could do so much with so little! Italian on the other hand is elegant and classy, but it’s certainly not easy. All words are looooong. Most words are complicated. Some words are unpronounceable! Asking my own children to learn something so complicated at such a young age can appear to be more like torture than a privilege. Do I really believe that my son will choose to say “rubinetto” instead of “tap”? Maybe I can ask for”automobile” instead of “car”, but surely I can’t expect a 2 year old to say “scavatrice autocingolata” instead of “digger”! It’s probably considered child abuse anyway. I will persist and do my very best to teach them. I’ll be rude and speak Italian to my children even in front of English people. I will correct their bazaar pronunciation of “buio” (dark) till it’s perfect and doesn’t sound like a new Teletubbies character anymore! I will read them book after book and talk to them in Italian, so that one day they will be able to say all those long and convoluted words. For tonight I’ll settle for “Babbo” (Santa). My husband and I are really puzzled and we have been for a few weeks now. Our boys have learned many new words recently and obviously quiet a few names. Names of family members, names of pets and even names of cartoon characters, but they still can’t say T’s name! It’s not a difficult name. It’s not that we usually call me with a nickname so they are not used to hear it. And it’s not even that it’s terribly uncommon or foreign (like mine!) and people pronunce it differently each time. No, it’s a very common name, in fact more than 20 boys in the school I work for are called like that! And yet it is apparently unpronounceable by the twins. We tried everything! We simply asked them to repeat after us. Nothing. We tried to ask “who is he?” to B or “who are you?” to T. Nothing! We used pictures of them and point at each child asking for the name. Still nothing! The boys now know the difference between Henry and Percy in Thomas the tank engine cartoon. To me they are two indistinguishable green trains. They know many words in two languages. I didn’t speak a second language till the age of 6. And yet they still don’t know both of their names… it’s just puzzling! We are not worried they don’t have their own identities like some identical twins do, we are just curious to why T doesn’t use his name and B doesn’t call him either. It’s so strange we reached an unusual conclusion… it’s a game! They know they are driving us crazy and they are having a laugh a minute by carrying this on. IT MUST BE THAT! The world of toddlers is full of magical discoveries, exciting adventures and incomprehensible words. They are so eager to communicate and share! 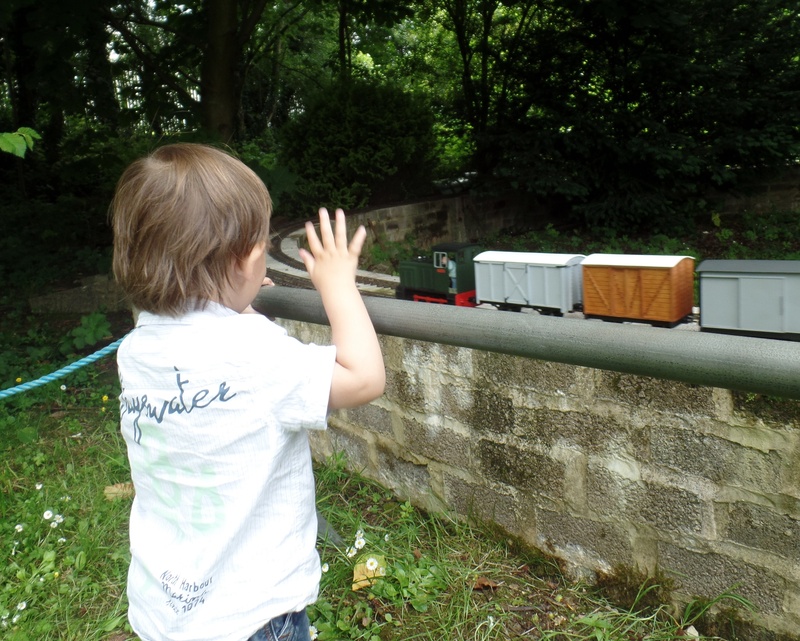 T, for example, loves trains and that seems to be all he talks about. What I mean by that is that his first word every morning is “choo choo” and his greetings every evening after nursery is still “choo choo”. We are trying to convince him that not everything big that moves goes “choo choo”. No, a bus does not choo and not even a lorry! He lives loves loves loves trains. Then if you put him on a miniature one, he screams and wants to get off straight away, but that’s a topic for another time. B can’t really say much. Recently he has learned some new animal noises, but words are still a mistery to him. He can say mamma, dada, nonna, door, “denti” (teeth) and fish or his own version of it: “pesch”(the Italian “pesce” and the EnglIsh “fish”). More recently he has learn a couple of vital words: “more” and “Clangers”. Guess what we have been watching a lot lately? Let’s not forget is favourite sound of the week “nee naow”. 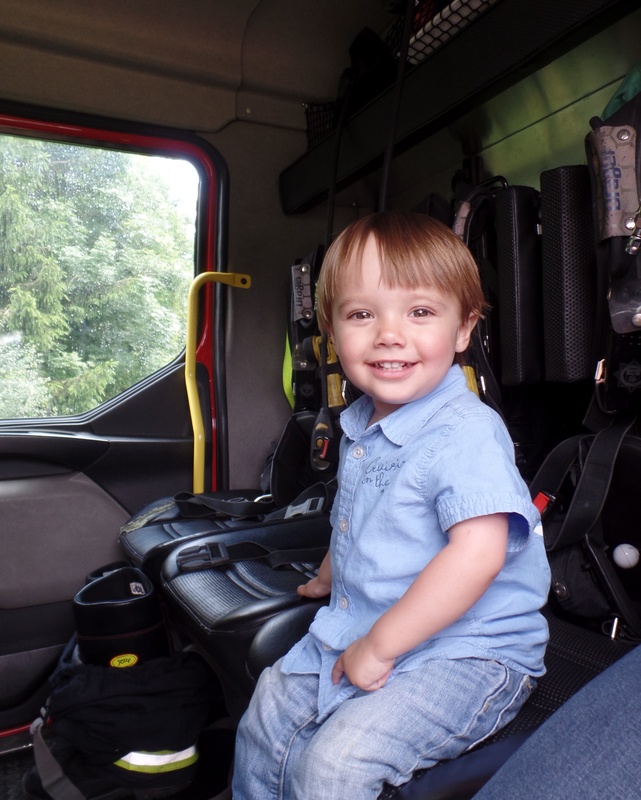 He enjoys so much pushing around his ambulances and fire trucks! B is actually very expressive and very creative, so he communicates in his own way. If he wants something to eat, for example, he would take your hand and literally drag you to the cupboard. Make sure you pick him up and then point to what he wants. Simple! My favourite new word is “olo”, it means olive and it’s T fave food by a mile. A little unusual for a toddler but it works. You need him to drink his horribly tasting medicine? Offer him an olive as a reward. You need him to calm down after a toddler tantrum? Here comes the jar of olives. You’ll not be surprised when I will tell you that I buy 1kg jar of olives now! T is making enormous progress with words lately. He has learnt to say “come back”. A two-word sentence you need a lot when your twin brother steals your toys on a daily basis! Last month we realised he can sign as well. I knew they could both sign “sleep”, but I didn’t know T signing vocabulary was so extensive. He can say thank you, please, duck, drink and he can obviously choo choo! Being twins they tend to copy each other a lot, so as soon as T started to sign “thank you” for his drink, B copied him immediately. 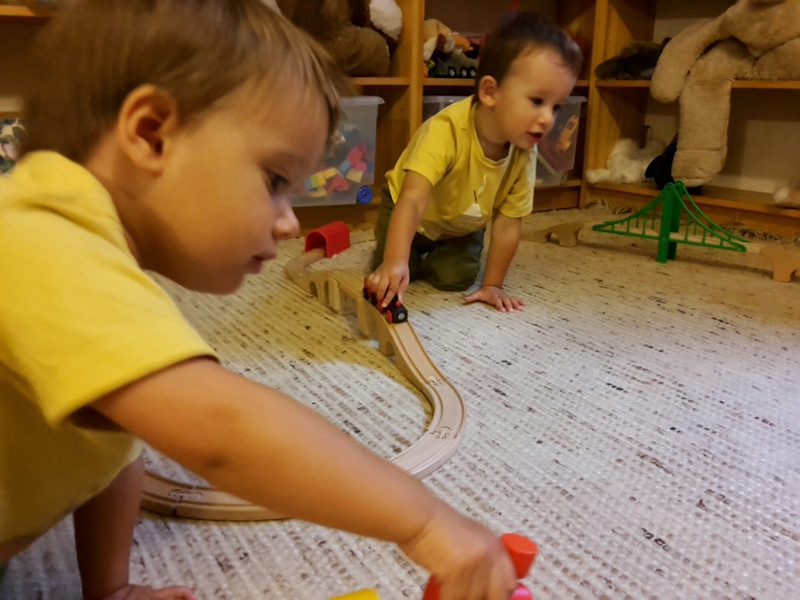 At the moment it feels like I will need to teach good manners to only one child… and the other will copy! 2 for the price of 1!